In Part I of this series, on shadows, I showed you how to use shadows for both subtle and dramatic 3D effects. Bevels often work hand-in-hand with 3D rotation, especially when you specify a depth in the 3-D Format section of the Format Shape dialog box. That’s because you can’t see the depth until you rotate the object. These 2 objects are the same, but only the right one shows the depth, because you’re looking at it from an angle. That’s what 3D rotation does–it shows you an object from an angle. Many people are unaware of the 3D features of PowerPoint, but they’ve been around for a long time. Even PowerPoint 2003 lets you rotate objects in 3D, although the controls are not as precise. 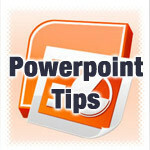 PowerPoint Tips Microsoft Office tips, powerpoint, powerpoint tips. permalink.